The vessel, Race for Water, left Lorient on Sunday, April 9 on a five-year Odyssey with mission to promote solutions to preserve the ocean. On a day of sunny weather and festivities, more that 8,000 people came out to support the vessel’s Ambassador and its crew. 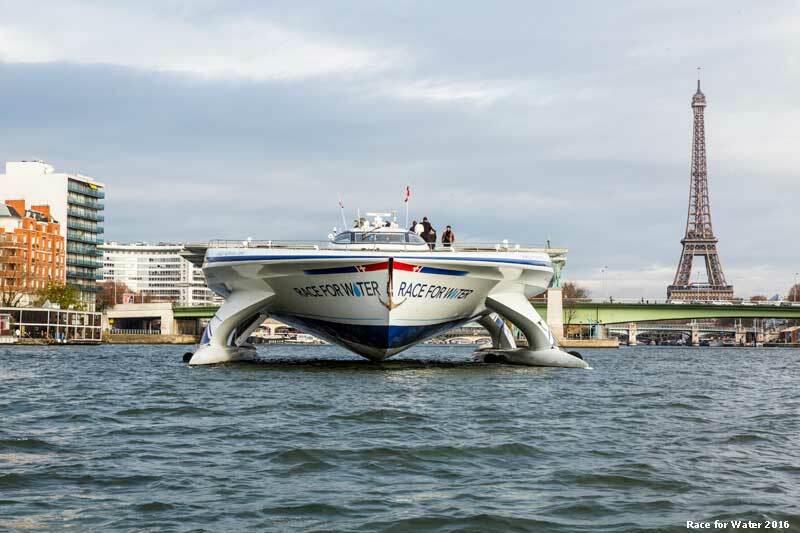 Race for Water is a state-of-the-art vessel powered by a mixture of renewable energy sources : solar, hydrogen and a traction kite. The first stopover will be Bermuda, for the America’s Cup, where Groupama Team France, the sustainable development partner of the Race for Water Foundation, is awaiting this revolutionary vessel. L’Orient Nautic, the South Brittany Boat Show, hosted the start of the Race for Water Odyssey on Sunday, April 9 ​​at 15:00 (French time). With festivities on the pontoons, visits on board Race for Water and meetings with the politicians and the press, it was a full weekend. In total more than 8,000 people were on the docks of Lorient’s submarine base. As the guest of honour of the 2017 boat show, Race for Water was the place for discussion and meetings. On the docks, the public had the opportunity to participate in guided tours of the vessel, where they met the crew, including its renowned captain, Gérard d’Aboville, and one of its Ambassadors, Alan Roura. Departing on a five-year expedition around the world, the Foundation aims to propose solutions for the conservation of the oceans. “With this Odyssey 2017-2021, we want to demonstrate that sustainable solutions for conserving the oceans from pollution exist thanks to innovative technologies,” says Marco Simeoni, President of the Foundation said. Promoting innovative solutions capable of transforming plastic waste into energy resources (with a machine developed with our partner, ETIA, whose pilot project will be carried out in autumn 2017). Advancing energy transition by showcasing our mixed solar-hydrogen-kite-powered ambassador vessel. Contributing to science by hosting international teams of researchers and educational science projects on board. Raising awareness among decision-makers, the general public and younger generations. Once Lorient is in its wake, Race for Water will head to Bermuda. There, the Foundation will meet up with its sustainable development partner, Groupama Team France. “Groupama Team France has the same passion for the oceans and technological performance as us,” Simeoni said. “They in the field of sport, and us for the environment.” By signing a memorandum of understanding with the Foundation, Groupama have committed to the Odyssey and will carry Race for Water’s messages for the conservation of the oceans. For its part, the Race for Water Foundation is committed to supporting Groupama Team France in its efforts to combat pollution of the oceans. Bruno Dubois, Groupama Team France Team Manager : "For many years, we have witness the deterioration of our ocean. Sailors who live the sea daily are worried. The scientists are too. We have long been committed to this cause and respect the environment when we are at sea. But more must be done upstream when on land, notably toward waste management or how to change our consumption habits. The Race for Water Foundation has for ambition to educate a large public all around the world. Our objective is to help the Race for Water staff on site in Bermuda, during the 1st stopover of their Odyssey. We will help them to promote this cause, to raise awareness of the problem and their proposed solutions, so that we can start to change habits. It’s urgent. Planning for tomorrow is now !" Marco Simeoni, President of Race for Water Foundation : "The Race for Water Foundation and Groupama Team France share the same passion of the ocean and high-performance : Groupama Team France develops technological innovations in order to increase their sailing performances, the Foundation proposes technological innovations for a better preservation of our ocean. This shared taste for challenge and performance brings us together to collaborate for the protection of the ocean. We are very proud to be with Groupama Team France as an environment partner on the occasion of the America’s Cup in Bermuda."